In one word, The Yellow Drawings show by Mark Mahosky, on view for a final week at Fleisher/Ollman, could be described as “disarming.” The stark, open gallery roils with dozens of large, bright, two-toned vistas, in jarringly smeared dark yellow acrylic and black charcoal. Scenes that hover between photographic and deeply and subjectively drawn, that seem distinctly, or at least possibly, informational while at the same time, a type of reverie. 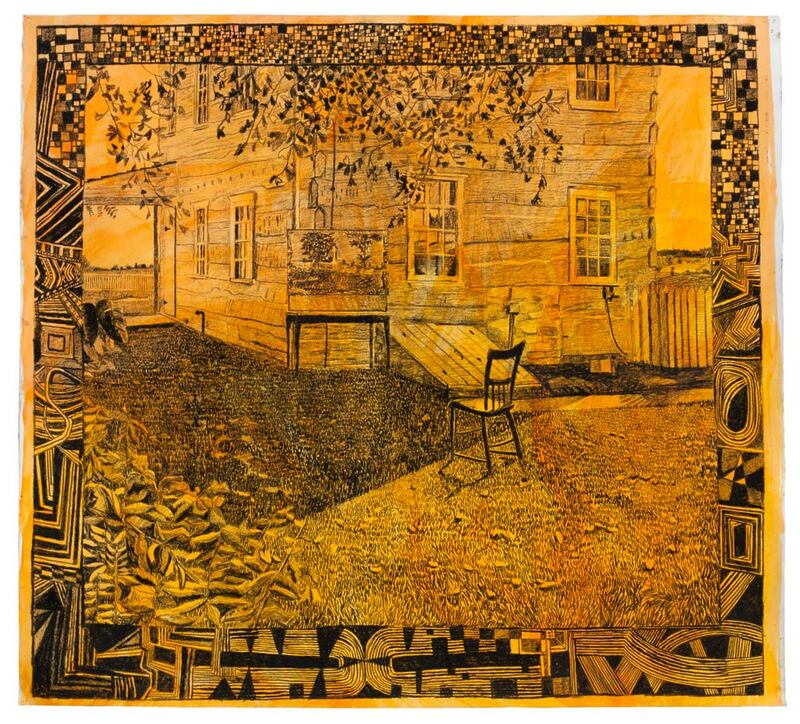 The imagery and handling evoke the ink works of Becky Suss or the woodcut prints of Matthew Colaizzo, in their simultaneous fastidiousness and looseness, the sense of intimacy coupled with the heavy distance of time. Fields of grain rendered with Van Gogh-like repetition set the backdrop for simply drawn carts, fences, rocks, trees, a monument, a gravestone, a chair; a kind of pastoral/historical ordinary. But the staid landscape scenes- rolling hills and placid architecture- belie the brutal history of the places depicted: Gettysburg, Antietam, and other Civil War killing grounds. The works were created over a period of thirty years, and many during Mahosky’s 2015 residency at Gettysburg National Park. There, Mahosky lived and worked in the Klingle family home, which had once been a site where Confederate soldiers were nursed, until the whole house was overtaken by the surrounding battle. Many of the works were drawn in plein air and others from photographs. In all of them, the space is stripped bare of the violence for which it is most known… it is literally dis-armed. Here in these drawings we are able, even asked, to separate landscape from history for a moment, to witness a presentness that may be other than the past. But can we perform such a separation? This impossibility of this is also what the drawings point to. Each one contains signs referencing memory, and how that memory has materialized into memorial, which has literally become inscribed on the land. The works articulate the ways in which the landscape has not only seen and held war, but become a site of tourism aimed at war’s memory, a veritable national shrine. In “First Massachusetts, Emmitsburg Road, Gettysburg” we see an unhitched cart marked with words that include Granite Co., and can surmise that within the cart must be a granite object, a monument perhaps. 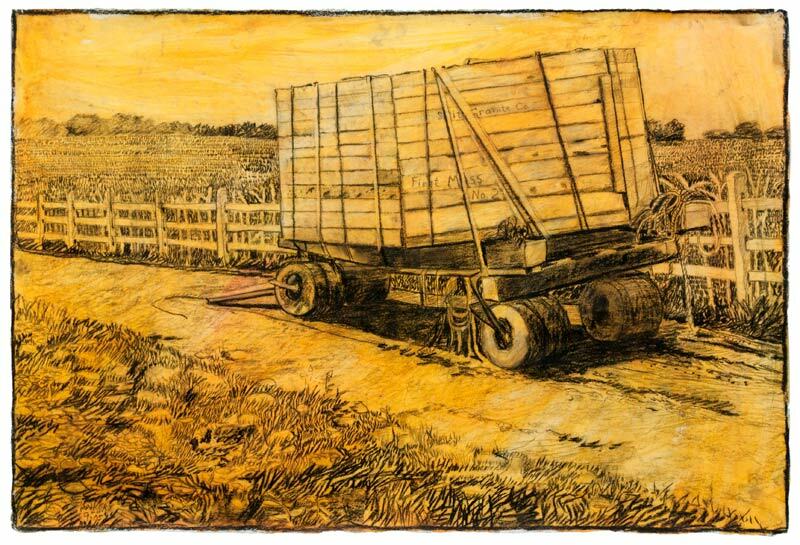 Indeed, this drawing comes directly from a historic photograph, showing one of the carts that carried a crated Civil War statue to its resting place. In this image, the monument is like a body, shrouded and in a state of procession. We get a sense of here of the made-ness of memory: the way in which land is landscaped to contain and make memory legible to us. The drawings also give a sense of their own made-ness, of the hand at work in the task of representation but also a kind of play. Mahosky’s drawn framing lattices, whose abstract meanderings line the edges of several drawings, offer a kind of imaginative margin and meditative space to stray from the stark reality of the seen. It feels like the hand riffing off of forms in the depicted landscape, departing from their intelligibility, circumnavigating their seriousness. A quilting together of the logic of space and the ephemerality of experience. More typical of Mahosky’s earlier work- abstract collage paintings and sculptures- the borders become framing devices that offer a kind of parallel world to the ones depicted; a kind of time travel, or spatial chaos, hinting at the fact that what is seen may not be enough. We learn in curator Alex Baker’s exhibition essay that the Gettysburg battlefield was “carefully manicured to look like it did circa 1863,” an act of construction to move the mind into an inaccessible past. These drawings engage in similar acts of construction, but seem to be less intent on mimicry or romanticism than a form of being present through a kind of piecing together of place. Their topologies attest to the artist’s commitment to the subject (Baker writes that Mahosky got a hold of William Frassanito’s book of photographs, Gettysburg: A Journey in Time, at age 10! ), one which seems rooted in a personal quest for an understanding of this place, and the type of actions and events it witnessed. The drawings convey a mature hand but also an innocent eye and mind,one that is searching for meaning and sense through the radical act that is just being in a place and paying attention to it. 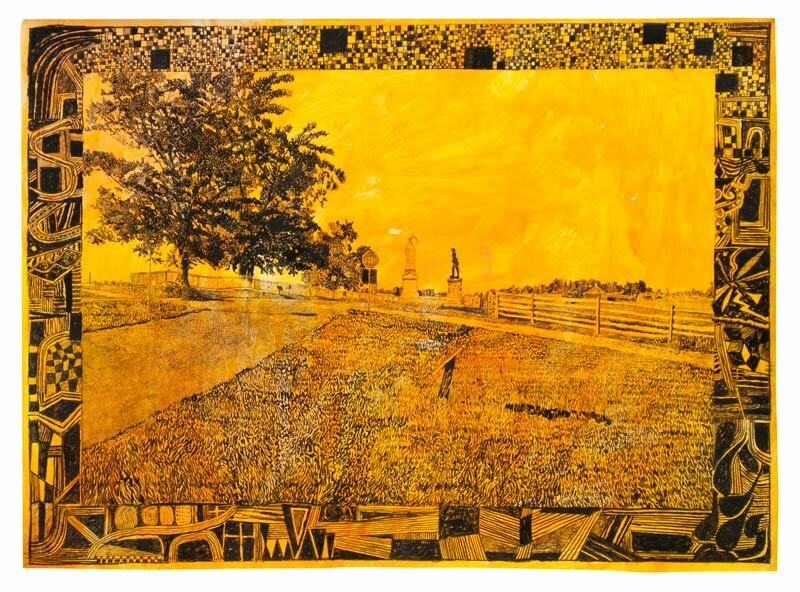 One of the most impressive works is “Emmitsburg Road, Gettysburg, June 2016,” which offers, within the elaborate, almost musical frame, a very quiet view: a constellation of monuments and infrastructure that are distant and muted, impossible to read. The closest one, which appears to be an interpretive placard, is positioned in such a way so that we see it just in silhouette. The two major monuments, an arm-like form protruding from a pedestal, and a man atop a base, engage one another, but not the viewer. It is like we are watching a human drama, even a war, take place from afar. There is a kind of sad humor to it. The most arresting of the drawn forms is a stop sign, which is shown head-on. Is this a message for the viewer, or for the monument-forms that surround it? It is hard not to try to draw these kinds of meanings from these works, which seem to contain semiotic secrets, or respond to those that exist in the strangely historied landscape that is the reconstructed environment of Gettysburg. The Yellow Drawings invite reflection on the kind of marks we make on place through events of history but moreso through the tactics of monument making. As drawings, they serve to remind us of the highly constructed nature of our country’s visual narratives of history, and offer an opportunity, and example, for how to fill in the depicted silences with new narratives.